Since the focus of the primary lens (which sits outside the lens wheel on the camera's PCB) is fixed once and for all, the modules on the wheel should not introduce any additional focusing, else the final captured image will be blurred. That is, they should not converge or diverge incoming light beams − they can only change the direction and thickness of an incoming beam of parallel light rays, as shown in Figure 2. 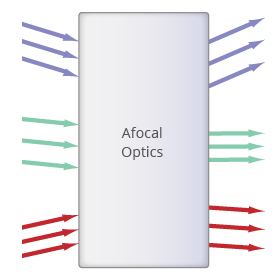 Such an optical module is called afocal  and can be designed to increase or decrease the field of view of the primary lens while keeping the image sharp (focused) . L. Stroebel and R. D. Zakia, The Focal encyclopedia of photography. Focal Press, 1996. M. J. Kidger, Fundamental Optical Design. SPIE Monograph, SPIE Press, 2002.